Expertise to support Research and Development, funding to ensure companies can be innovative, and case studies demonstrating that research collaboration with third levels really can bring commercial benefit, were the key topics which attracted a huge number of delegates from companies of all sectors and sizes across the region. The event was held at the new Nexus Innovation Centre, UL and included speakers from the LIT, UL and representatives from companies who have successfully partnered with third level including; Powervation, Aerogen and Algae Health. The availability of R&D funding, specialised equipment and expertise, and a community of experts to collaborate and solve problems all assisted these companies to develop and grow their businesses, progress which may have not been possible without such collaboration. In his opening remarks, local deputy Patrick O’Donovan re-affirmed the government’s commitment to research, development and innovation highlighting the dedicated appointment of Deputy Séan Sherlock who is Minister of State at the Department of Jobs, Enterprise & Innovation and Education & Skills with special responsibility for Research & Innovation. Deputy O’Donovan stated that a key objective of the government’s plan is to continue to use research and innovation to build competitive advantage and that effective industry-academic collaboration is essential for the successful translation of the best new ideas from the lab into innovative new products and services in the marketplace. 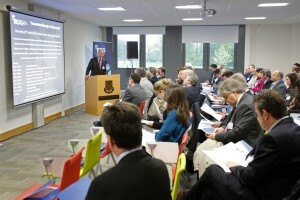 This Enterprise Innovation Network (EIN) event was supported by Enterprise Ireland. Our thanks to UL, LIT, Powervation, Aerogen, Algae Health, STL Logistics and Patrick O’Donovan TD. ← R&D TAX CREDIT AUDIT – BE PREPARED!